Do you love where you live? Squire’s Garden Centres certainly do, so they are working with local councils to make our parks and green spaces even more attractive, by donating thousands of daffodil bulbs in their “Love Where You Live” campaign. Throughout September, for every pack of bulbs (of any variety) that customers buy, Squire’s will donate 10 daffodil bulbs to local councils, hospitals and community gardens. Squire’s hope that they will be able to donate around 150,000 daffodil bulbs! 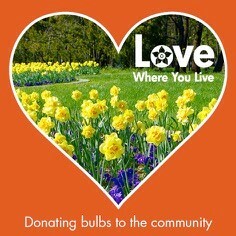 So head to Squire’s now to buy your bulbs, and your local community will benefit too. Group together – Plant bulbs in clusters of uneven numbers, or mix different bulb types together.